Relay for Life Co-Presidents Isabella Alonzo ’18 (left) and Kathryn Bullen ’18 after last year’s Relay for Life event. Relay for Life is a yearly fundraising event held by the American Cancer Society. Each year, thousands of communities come together to walk in order to both raise money and spread awareness. Middlebury has hosted a Relay for Life event each year since 2004. Members of the college and wider Addison County community come together for the event, and have raised tens and often hundreds of thousands of dollars per year. This year’s Relay for Life event will take place on April 18, 2018 at the “Battell Loop” outside Battell Hall. For more information on the event, please click here. This week, we talked with Kathryn Bullen ’18, one of the co-presidents of the college’s Relay for Life student organization. Why should folks join Relay for Life? What will they take away from the experience? In one way or another, everyone is touched by cancer at some point in their lives. Relay For Life is a great way to help raise awareness regarding cancer and honor/celebrate those who have been personally touched by the disease. At Middlebury, this organization provides an avenue for working with both the student body and surrounding community members. This experience allows people to give back in some way towards a disease that often leaves people feeling powerless in their ability to help those personally affected. Why did you first join Relay for Life? I joined Relay For Life because I wanted to become more involved on campus in a meaningful way. From friends and family members of mine who have been touched by cancer, I felt motivated to join Relay and help give back in the ways that I could. Also, I participated in Relay For Life growing up and they were always fun events to attend. What has been your most memorable experience as a member of Relay for LIfe? I think my most memorable experience as a member of Relay is always the luminaria ceremony. During this part of the event, everyone walks around the loop, which is lined with luminaria bags in honor/memory of people affected by cancer. As we walk, each bag gets a glow stick and it truly turns into a beautiful moment where everyone can reflect on what the event is truly all about. What have you learned, either about yourself or the world around you, as a member of Relay for Life? From being a member of Relay For Life, I have learned so much about how to organize a large-scale event on a long-term basis and how to be an effective student leader. I have definitely realized how much planning truly goes into events like Relay and the importance of having a great committee to delegate tasks to and help with all the details throughout the year-long planning process. 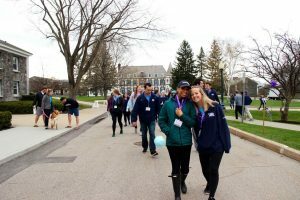 I also think Relay For Life is a unique organization in that it requires targeting both college students and Middlebury community members, which necessitates almost two separate marketing tactics. While this has been a challenge for our committee, it is an aspect of our event that we definitely have put greater emphasis on this year. I am from Cleveland, Ohio, and am a psychology major and double minor in political science and global health. I am on the Women’s Swimming and Diving Team and a captain this year. I also am a member of the Student-Athlete Advisory Committee (SAAC).